As the weather is getting warmer, my appetite is warming up to light soups. In the Winter, I tend to stick to the starchier vegetables, like parsnip, sweet potatoes, and carrots. 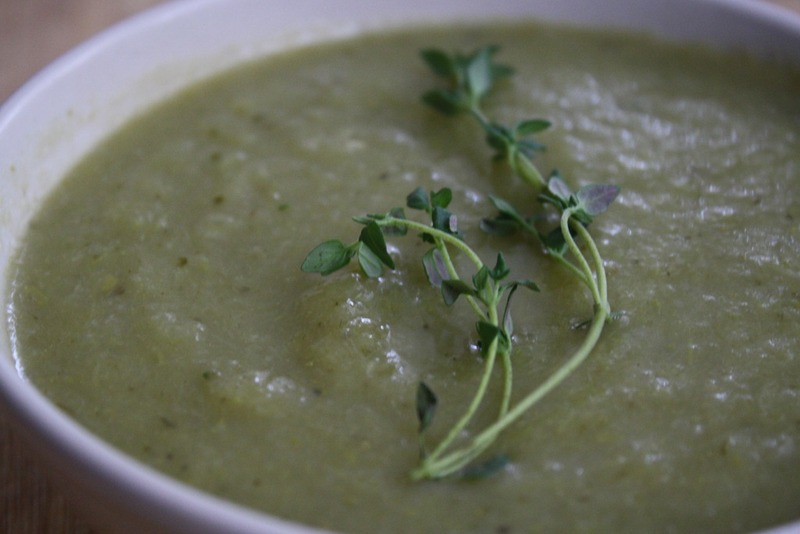 In the Summer, I’m all about the fresh, cool soups such as Gazpacho or a fruit-based soup. 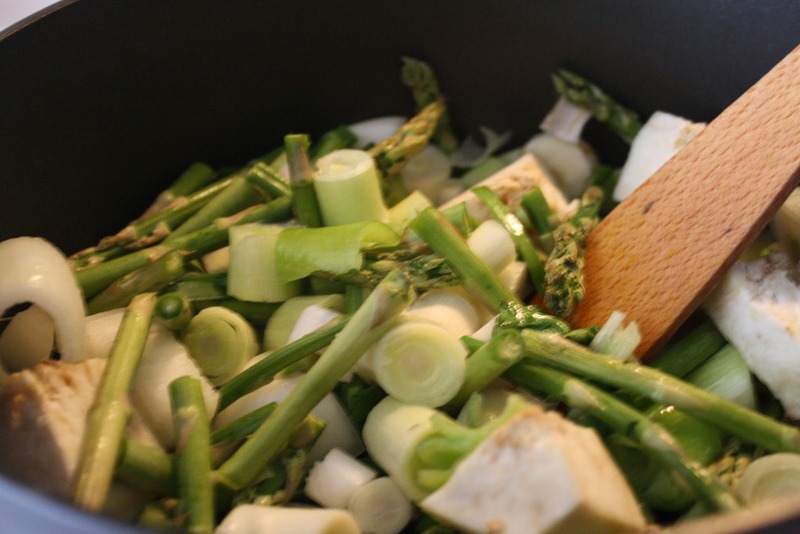 However, Spring is about bridging the way from fireside to poolside, and this recipe uses Springtime favorites such as leeks, Vidalia onions, and asparagus while still incorporating a root vegetable – celeriac – to keep the comfort level. 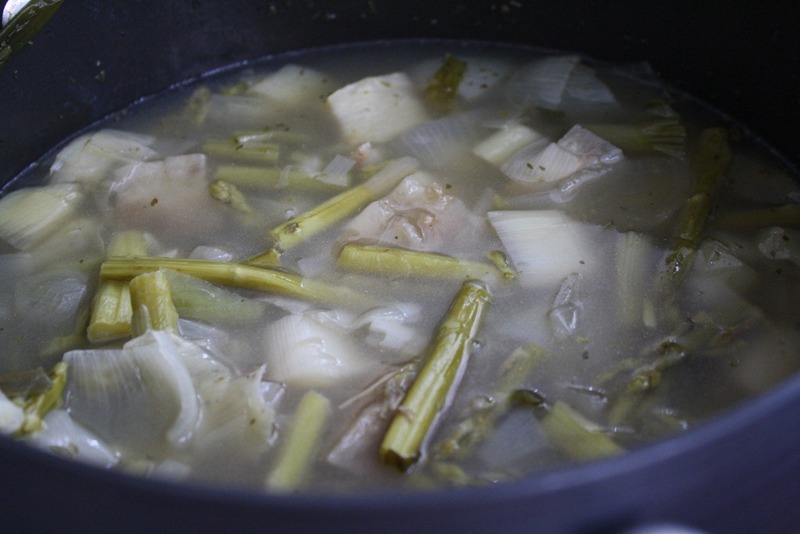 The backbone to the flavor in this dish comes from the leeks. And they far more than just taste-savvy. 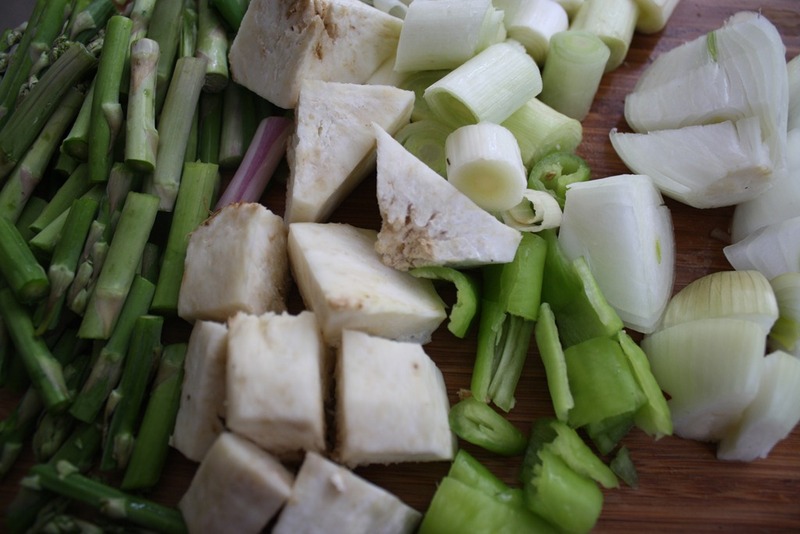 Leeks are especially notable for their role in a promoting a cardiovascular health. They are known to raise HDL (good) cholesterol and lower LDL (bad) cholesterol, effectively preventing plague build up in blood vessels and arteries. They also decrease high blood pressure and are thus useful in preventing the occurrence of a stroke or heart attack. Leeks are also a powerful antiseptic and fight against infection. 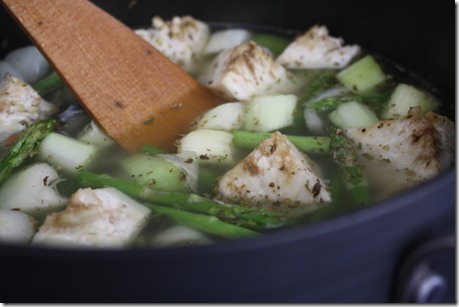 The other stand-out veggie in this soup is asparagus. Asparagus juggles a lot of responsibilities. It is detoxifying, decreases the risk of heart disease, protects against cancer, has anti-aging properties, prevents osteoporosis, staves off pain and inflammation, and is considered an aphrodisiac in many cultures (but mostly for its shape than for a scientific reason). Served warm or cold, it’s nutritious and flavor-packed! Remove the stem and skin of the celeriac and roughly chop. Snap off about an inch from the end of each asparagus spear and slice into thirds. The spears will break naturally where they need to if you bend them to snap rather than cut them with a knife. 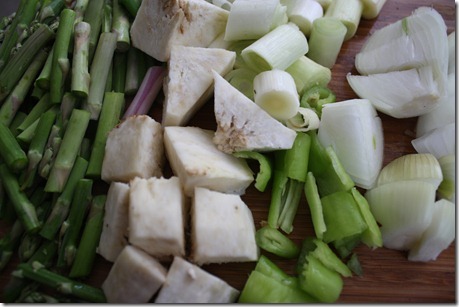 Chop the leeks into 1-inch thick pieces and soak in water to remove any sand. Slice along the length of the pepper, remove any seeds and flesh, and chop. Peel the garlic cloves and chop the onion. In a pot over medium heat, melt 1 tablespoon of butter. Add the chopped vegetables, salt, pepper, and thyme. Mix over the heat for about 2-3 minutes. Add 4 cups of water. Bring the mixture to a boil, then reduce the heat to a simmer and cover the pot with a lid. 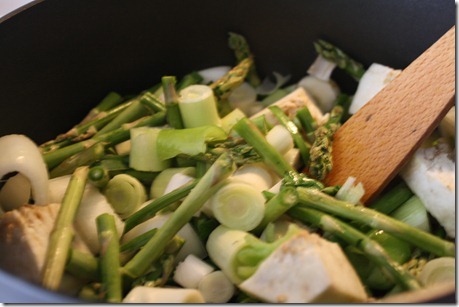 Let simmer covered for approximately 25 minutes, or until the onions and asparagus are soft. Let the mixture cool. Before serving, blend the soup until smooth. 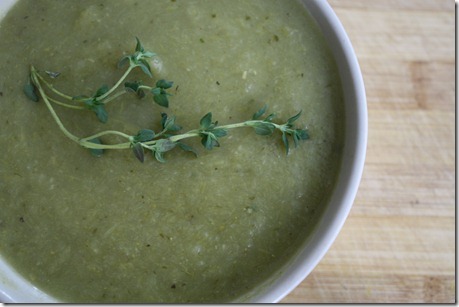 You can warm up the soup in a saucepan or enjoy it cool. Garnish with a sprig of fresh thyme. Aylin Erman currently resides in Istanbul and is creator of plant-based recipe website GlowKitchen. This entry was tagged asparagus, celeriac, leeks, soup, spring, vegan, vegetarian. Bookmark the permalink. EcoSalon Contributions Connect to all my lifestyle, food, and nutrition articles on EcoSalon! Organic Authority Contributions Connect to all my lifestyle, food, and nutrition articles on Organic Authority! Setup and redesign by Petter Andersson.